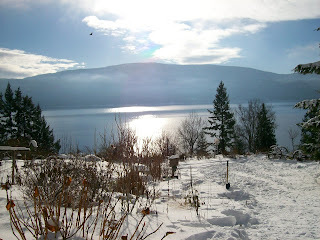 We decided to head to the lake for Christmas to spend it with family. It was the first time in ages that I haven't been responsible for Christmas dinner and it was a welcome change. 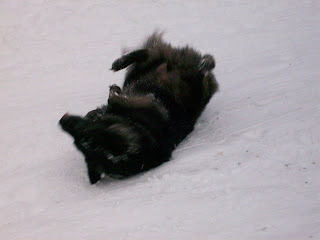 Much of our time was spent outdoors walking and enjoying the snow, the quiet and the antics of the dogs. 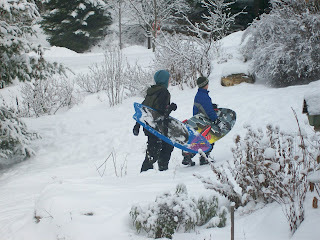 We also spent a lot of time sledding. 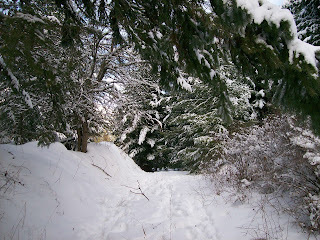 Here is a picture of our sledding hill, you can see part of it on the right-hand side of the photo below. What you can't see is the big pile of snow that my Dad had been making with his tractor for weeks, it gave us quite a slope to start us off on. * Heather's handy hint -Kneeboards (meant for using behind the boat) make for super fast sledding and it is always a good idea to be aware of how fast something goes before heading towards a drop-off. Just a little further and I might have been taking an early polar bear dip. 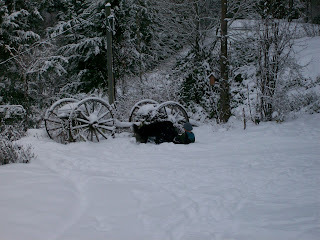 On the rest of the runs we decided to aim for the wagon...a risk of a bit of a quick crash stop seemed a better idea than a drop down the bank into the lake. 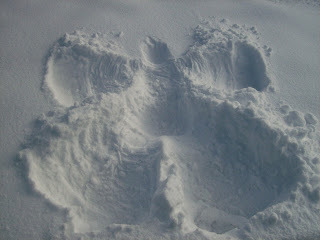 When he wasn't eating the snow E had fun making an angel. 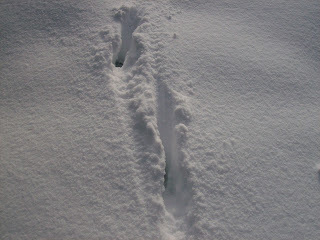 We also spotted these tracks. Deer or reindeer? You decide. Beautiful photos, Heather. They could be made into a calendar, especially the lake shot and of course the rustic wagon shot. Love them. Hee hee. I can just picture you whipping down the hills at your folks'. Sounds like lots of fun! Glad you got to spend time with your family and have a break from hosting.